Welcome to Germany. Flights into Nuremberg must arrive by 4 pm. Guests must be on board ship by 5 pm. Experience the glowing Christmas markets of the beautiful Blue Danube for a holiday season you’ll never forget. Begin in Nuremberg to enjoy German Christmas traditions, and take a guided tour to see the city’s medieval architecture, gilded fountain, gothic cathedral, and Kaiserburg Castle, You may also choose a guided tour of WWII Nuremberg Rally Grounds used by the Third Reich. You’ll cruise to the magical town of Regensburg for a guided city walk of its historic Old Town, enjoy a German beer tasting on board and cruise toward Passau where the Danube meets the Inn and Ilz Rivers, and sail on to Linz with its legendary Linzer Torte for a holiday treat. Cruise to lovely Melk, Austria, and tour the magnificent Benedictine Abbey. Take in the wonderful wine region scenery as you sail through the stunning Wachau Valley. You’ll arrive in Vienna to discover the gilded landmarks in the City of Music. See the Imperial Palace of the legendary Habsburg family, the historic Vienna Opera House, and spectacular St. Stephens Cathedral. You’ll marvel at Vienna’s Christmas Advent Market with its warmth, confections, and delightful seasonal mementos. 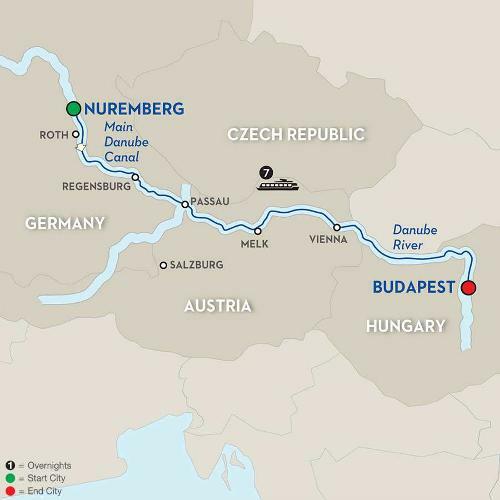 Cruise to Budapest, the “Pearl of the Danube,” for a guided sightseeing tour of iconic sites such as Heroes’ Square. Discover the special Christmas markets in this shining city, and take time to explore local pubs and cafes. Sample strudel, savor the sights of the season, and discover the age-old traditions of a European Christmas Market on your Danube River cruise to remember for many seasons to come.